This summer, I've made a special effort to do a little pre-schooling with Cooper. I want him to get used to what "school" was like. 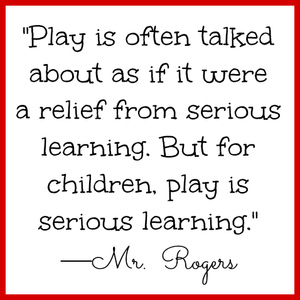 And I want him to learn early that learning can be and is fun. Plus, it adds some more structure to our day instead of just free play all day long! Cooper already knew most, if not all, of his letters. So during our reading time, we work on letter-sound associations. I used the letter cards from my Word Wall Packet. We added one letter at a time and talked about the sound and corresponding picture. I would read, "A, /a/, apple" and he would repeat again. It took us 3 or 4 school sessions, but we finally got all of the letters up! Now, every school session, we start off reading our ABC chart. He loves finding a fun fishing pole or toy flag pointer to use to "read." And after almost a month of school time, he can read almost the whole ABC chart by himself without any corrections! I just love this sponge age. He soaks everything up! "But I tan't weed, Momma!" "Yes, you can...start with A..."
"A, /a/, appuwl..." and he finished through the whole alphabet and said, "I tan weed, Mommy, I tan!" Talk about melting my mommy and teacher heart all in one! Now he proudly tells us almost every day, "I'm a weally good weeduh, Mommy!" Then, we do "writing." For the last month, we've been writing Cooper's name. We spell out each letter, and then practice sliding our finger across the word to read it. And we have written his name in all kinds of fun stuff...since those little fingers aren't quite ready to trace! He's just so, so proud! Pinto beans...no buying new supplies here. Just using what we have! 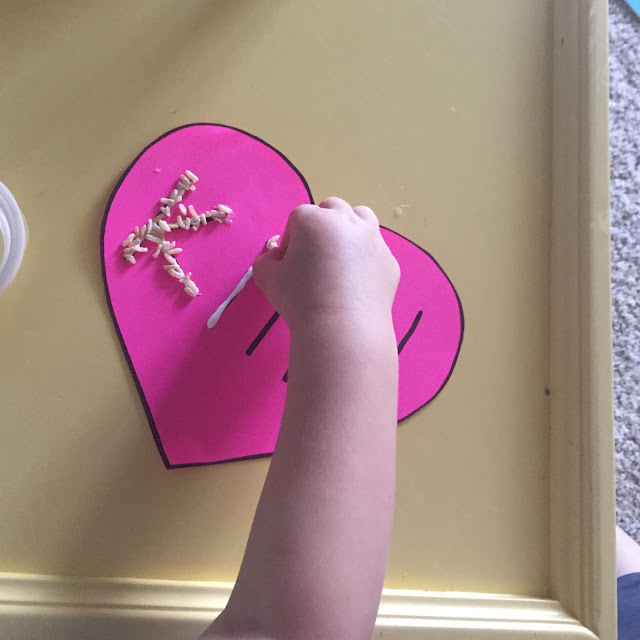 I love using things to glue down because it gives me a chance to repeat the verbal paths for handwriting our letters over and over. The more this gets ingrained in his head, the easier I think handwriting will be for him when his little fingers are ready to write. He even tries his bardest to repeat the scripts back to me... #bestillmyheart You can grab this FREEBIE from my TPT store. 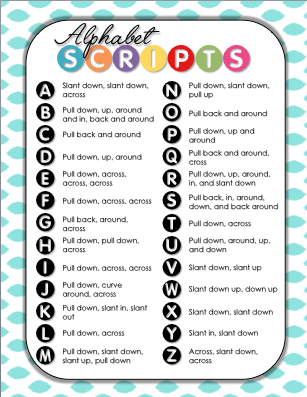 It includes the scripts for capital and lowercase that I use in my first grade classroom! Yesterday, we did "Kind" and wrote it in rice. This will look so cute hanging in his play room as an extra reminder! And I love that he made it himself! Of course, we always save plenty of time before nap for story time to practice all of our reading and CAP skills! He loves finding the cover, the title, reading the title with his reading finger...and he even has a few books that he can "read" on his own! Love watching his brain grow! The possibilities are endless for fun, engaging literacy activities for our littles. How else do you teach those early literacy skills?